Today is New Year's Eve, and I have gathered all of my Studio Q highlights from 2015 to share with you. Studio Q is an online show that I created to interview the stars you love. If you have ever watched one of my celebrity interviews, re-tweeted one of my tweets, or liked one of my posts on Facebook or Instagram, I thank you and appreciate your support. I am so grateful that I experienced yet another amazing year of doing what I love. I look forward to becoming better at my craft and taking Studio Q to the next level in 2016. Scroll down and check out my 2015 year in review below. Happy New Year! I'm wishing you everything you want in 2016! I was thrilled to be invited to ask Emmy-award winning Regina King, Orange is The New Black's, Dascha Polance and the legendary Hip-Hop duo Salt N Pepa a question on HuffPost Live. Cheryl 'Salt' James even remembered me from an interview I did with her and Pepa in LA. I was grinning from ear to ear about that. Watch all of my questions below. I was so excited that the legendary Missy Elliott followed me on Twitter this year. I was even more excited when she tweeted about missing Whitney Houston (which I do too by the way) using my interview with Whitney. Now that's dope! Shout out to my Facebook friend Jimi Whitneylover Te nana who let me know. Facebook is great for a good tag. Interviewing Missy Elliott in 2016, would be the icing on the cake. Let's claim it, shall we? So happy Missy graced us with some hot new sounds and a dope new music video this year. Make sure you cop her new music. We gotta keep supporting futuristic legends like her. I was so honored to interview the legendary Chaka Khan and her daughter Indira Khan at the launch party for 'Daughters of Soul' at Maverick's Flat in Los Angeles. We talked about motherhood, honesty and Indira playing her iconic mom in the upcoming Miki Howard biopic, which will debut on TV ONE in June 2016. We also talked about what it was like to grow up as Chaka Khan's daughter. Watch my interview below. Chaka Khan even posted my interview with her to her Facebook page and thanked Studio Q on Twitter for capturing her playing the drums that night. I was asked to exclusively cover the launch party for 'Daughters of Soul' at Maverick's Flat in Los Angeles. Founded by singer, Sandra St. Victor (The Family Stand) in 2004, Daughters of Soul include daughters of six soul legends: Lalah Hathaway (Donny Hathaway), Lisa Simone (Nina Simone), Indira Khan (Chaka Khan), Kori Withers (Bill Withers), Syleena Johnson (Syl Johnson) and Sylvette “Phunne” Stone (The Family Stone’s Sly Stone and Cynthia Robinson). These ladies performed to an intimate crowd and had everyone grooving with a jam session. Click above to watch my interviews with the Daughters of Soul. I was invited to Yo Yo's private screening of her 'Unsung' episode which appeared on TV One. I interviewed Yo Yo, her mom, grandma, cousins and friends on the red carpet about her amazing career in Hip Hop. I even periscoped live from the event. I loved being able to interview one of the legendary west coast women in hip hop. She's a role model and a legend. I interviewed Syleena Johnson and watched her perform for the first time at the Daughters of Soul launch party at Maverick Flats in LA. This R&B Diva is as cool and down to earth as they come. Watch my one on one with her above. I had so much fun interviewing Angell Conwell and Omar Gooding during a set visit on Bounce TV's hit sitcom, 'Family Time.' Family Time chronicles the lives of the Stallworths, who have recently relocated to the suburbs. High school sweethearts Tony Stallworth (Omar Gooding), a struggling general contractor, and Lisa Stallworth (Angell Conwell), an energetic stay-at-home mom, lovingly quarrel with each other and their mischievous children, Devin and Ebony, as they make up their own rules for love, marriage, and family along the way. Family Time comes on every Tuesday on Bounce TV at 9pm/8pm central. You can watch full episodes of the show here http://www.bouncetv.com/video/. Check out my interview with Omar and Angell below. I was so honored to get the opportunity to interview legendary hip hop duo, Salt N Pepa on the set of Bounce TV's hit sitcom 'Family Time'. I also interviewed the cast of 'Family Time' and they were all as excited as I was to be hanging out with Salt N Pepa. The episode they were filming that day was all about the group. Watch the trailer for my interview with Salt N Pepa who were both mad cool by the way. I interviewed the amazing saxophonist Kirk Whalum, who has worked with top artists like, Barbara Streisand, Al Jarreau, Luther Vandross, Larry Carlton, Quincy Jones and most notably, Whitney Houston. It’s his sax heard on the mega-hit, “I Will Always Love You." Check out the trailer for my interview with Kirk, which you can watch exclusively on VHX. Visit StudioQ.vhx.tv to learn more. I interviewed the stars of the two top-rated OWN series (Sweetie Pies & Raising Whitley) including Miss Robbie Montgomery, Tim Norman and Kym Whitley. Watch my live periscope of the press event below and see me ask the cast a question. I Became Obsessed with Periscope and Created "Q's Celebrity Scope," "Q Tips," and "Behind The Interview"
In the summer of 2015, I discovered the periscope app and became obsessed with it. I wasn't the only one too because it was named the #1 app of the year. I learned so much from watching other people's broadcast. It kept me up many nights just watching my phone screen. My first periscope show was "Q's Celebrity Scope," where I showed all of my red carpet interviews with celebrities. In 2016, I will bring my shows "Q Tips" and "Behind The Interview" to periscope which will feature my red carpet tips and the stories behind my interviews. Watch some of my periscopes below by clicking on the picture. I launched a weekly blab show called "Black Girls Talk" which later evolved into "Studio Q LIVE," and co-hosted it with my producer and bestie, Tam. Blab is an exciting and new platform in which you can join via live stream video, or simply chat while watching. It was fun to chat with friends and strangers about pop culture. We did a lot of laughing on blab. Shout out to everyone who joined us in 2015 on our blab show. Make sure you SUBSCRIBE to me on blab by visiting Blab.im/Quencie. To learn more about Blab, visit: Quencie.com/howBlabWorks. Watch all of our past episodes by clicking the pic below. How cool was it that the super dope Zendaya shouted me out on video in 2015. She is only the darling of the fashion world who has her own personalized Barbie doll. Zendaya has to be one of the best role models that we've seen come out of Disney in awhile. I think she is a class act and on her way to being a huge superstar. Now I have proof she knows me, uh well at least my name, lol. This video was made possible by her sister Kizzy who is friends with my bestie and producer, Tam. They were co-workers once upon a time and out of nowhere Kizzy surprised me with this video. Kizzy is such a sweetie. Thanks Kizzy! Love you, longtime. In September I attended the 12th Annual Celebrity Bowling Challenge to ‘raise awareness of Sickle Cell Disease’ hosted by KiKi Shepard and The K.I.S Foundation. The event was held at PINZ Entertainment Center in Studio City, CA. I had a blast doing red carpet interviews with celebrities, Gabrielle Dennis (Rosewood), Rocky Carroll (NCIS), Tonya Banks (Little Women), Dawnn Lewis, Richard Brooks (Being Mary Jane), Elise Neal (Hollywood Divas), Omar Gooding (Family Time) and Affion Crockett. Check it out below. I'm so heartbroken over the passing of Whitney Houston's daughter, Bobbi Kristina in 2015. I'm praying hard for her family to deal with two such tragic losses. Before Whitney or her daughter died, I put together a video that celebrated the mother-daughter bond that was so strong between them. Bobbi Kristina has watched and re-tweeted my video on a few different occasions. It now has almost 2 million views. I pray that Whitney and Bobbi Kristina are reunited in heaven. You can watch my tribute video below. 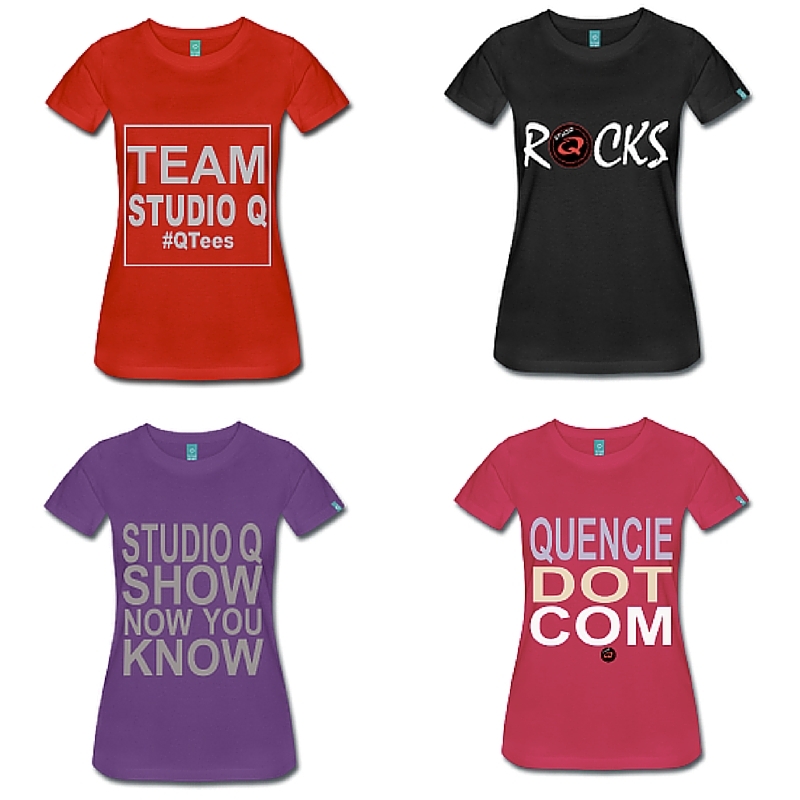 You can now get your Quencie & Studio Q shirts on Quencie.com! Click here http://bit.ly/StudioQStore to start shopping. All shirts come in several colors and sizes, and will arrive in just a few days! Shout out to my best friend Tam who became a new mother in the midst of helping me with all things Studio Q. She adopted this adorable little boy in 2015, who has also became my new Godson. Even with this amazing life transforming event taking place in her life, Tam has still went above and beyond for Studio Q and I am forever grateful for her. We all need a team, and Tam is that plus 2. She relaunched Quencie.com on Squarespace without even knowing what Squarespace was. Every time I came up with a new way to win she was right there to support me. She created my media kit, co-hosted the blab show with me and has literally filmed every Studio Q interview I have done since 2012. The only difference now is we have to find a babysitter after we say yes to an event or an interview. What a difference a year makes! Thank you Tam for everything you contributed this year along with being a full time mommy! Jayden is already an amazing addition to the Studio Q family. We even taught him the theme song that Tam sings to the Studio Q show. He now randomly sings it in line at grocery stores. Don't believe me? Watch below. Studio Q show now ya know! I also own QuencieThomas.com which is my full government name. Please visit and sign up for my Studio Q newsletter. Be the first to see my celebrity interviews as well as the behind the scenes exclusives with the stars you love! Join us for all the excitement coming in 2016. Visit me by clicking here http://www.quenciethomas.com/ or on the button below.